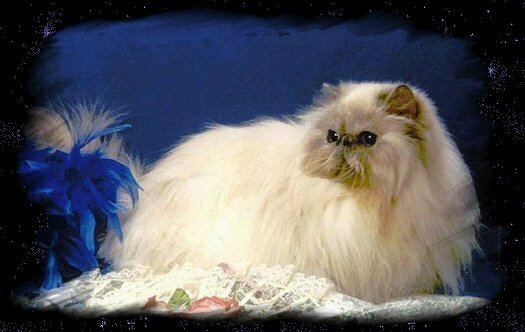 I fell in love with my first Himalayan in 1983 - CH & GP Honalee�s Tobacco Rhoda of Purrstar. Peg Thornhill and Judy Sandy really didn�t want to sell her but I begged and will ever be thankful they let me have her. She was followed shortly there after by Ch Honalee�s Ganymede of Purrstar. 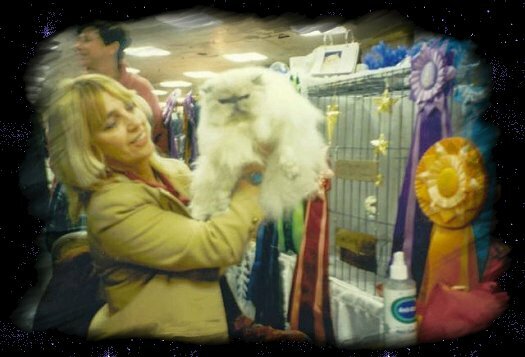 Mede produced the first CFA Grand Champion for Purrstar, GC Purrstar�s Regulus born in July 7, 1986. He was so far ahead of his time I even had a few judges comment that he might be too extreme, but they had to use him anyway as he was so beautiful. In 1988, GC GP Purrstar's Somethin' Elsa was born. What a cat! She loved to be shown and begged for a bath on Friday nights if we weren�t going to a show. I have never seen a cat that knew she was really something else like she did. I later purchased CH Oakheaven�s Ursa Major of Purrstar and CH GP Madame Nu�s Sheer Value of Purrstar to round out my breeding program at the time. In 1991 I fell in love with the idea of pointed Exotics and working with Donna (Duna) Wilbanks of Starship founded the Starbourne Exotics which produced many really nice pointed Exotics including one of the first grands, GC Starbourne�s Dreams Never Die. Please see Exotic pictures in our gallery and link to Starbourne Exotics.